Last Friday night Stuart and I went to see ridiculously complicated restoration comedy The Way of the World at the Donmar Warehouse in London's glitzy West End. Restoration comedies are opening like dandelions in the West End at the moment - this is the third in a week. They are like sprouting dandelions, with the emphasis on the dandy. For these shows are packed with men who like a bit of stocking, not to mention a tightly fitted brocade coat. Each dandy wanders through the muck and mire of love, catching one madly wordy and witty play after another. They are all obsessed with status and money, marriage and love. But especially status. Last week the RSC launched The Fantastic Follies of Mrs Rich, written in 1700 by Mary Pix. Then it was The Country Wife (1675) at the Southwark Playhouse. And now we have The Way of the World, written in 1700, the final play by William Congreve. So, yes, we're partying like it’s 1699. Luckily for us, James Macdonald's stylish account of Congreve's script is terrifically funny. At the heart of its giddying plot are two lovers, Mirabell and Millamant, who tentatively sketch out a contract for a more equal form of marriage as they inch towards one another through a maze of obstacles. There’s a wonderful sense of relief, here, when Geoffrey Streatfeild’s shrewd, articulate Mirabell and Justine Mitchell’s mischievous, intelligent Millamant finally drop the artifice and risk honesty. 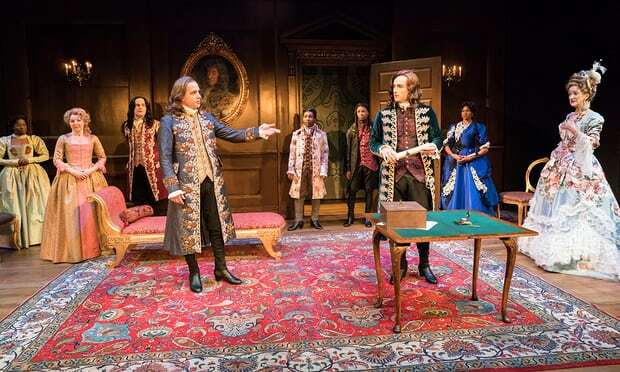 Around the two lovers circle a top notch cast sporting masses of intrigue, buckets of witty bon mots, extravagant frocks and even more extravagant frock coats. Outstanding amongst these circling players is Haydn Gwynne's Lady Wishfort. She is absolutely hilarious in the role of this wealthy, vain and silly woman who strives to act younger than she actually is. Hectically trying out various becoming postures in which to be discovered by a (phoney) admirer, she falls right off her chaise longue. "Nothing is more alluring than a levee from a couch in some confusion," she insists undeterred. There's the odd twinge of pathos, too, as when she examines her cracked face in a mirror. "I look like an old peeled wall" she concludes. Other stand outs in this glittering comedy are Fisayo Akinade’s wonderfully ridiculous fop, Witwoud, and Alex Beckett as a servant masquerading as a dashing lord. But there is also real cruelty in Jenny Jules’s bitter, brittle Mrs Marwood and Tom Mison’s smoothly vicious Fainall, who you suspect is capable of genuine malice towards his wife. If you like your comedy fully "restored" - this is the show for you.